While browsing the blogosphere recently, I came across a blog post that asked a really interesting question. What would propagation be like on Mars? That caused me to do some serious thinking, and in doing so, I've come up with how I think it might work. I am not an expert in Mars, nor an expert in propagation, but I do know something about Mars and something about Propagation. This post is intended to study how it might work, but not be an actual journal quality paper or anything like that. In my explanation of this, I will draw on articles from Tim Mooney, Wikipedia, Window to the Universe, the European Space Agency, NASA, and Arnauld Valeille. This represents the best information on the subject I could reasonably easily obtain, however, the MAVEN mission coming up in 2014 will provide more information about the atmosphere of Mars. In order to answer that, let's first start by asking how the atmosphere of Mars is different from Earth. The base material in the atmosphere is Carbon Dioxide. At the surface, the pressure of the atmosphere is about 0.6% as that on Earth. 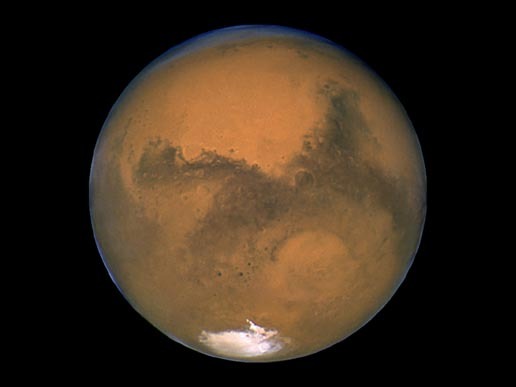 Mars has a lower gravity, which will tend to allow for particles to be higher than they otherwise would. Furthermore, Mars does not have a magnetic field like Earths, but it does have pockets of magnetization. There is an Ionosphere, which as barely been characterized on the night size, but on the day side, is around 150 km. It is primarily composed of O2+, with some O+. This fits roughly at the level of the E layer of Earth's Ionosphere. This was detected by using spacecraft orbiting Mars, and using relatively high frequency radio waves, and sensing the difference between ground reflected and atmosphere reflected radio waves. MARSIS uses 0.1 to 5.5 MHz, which contains the 80 and 160m Ham Bands. Given just this information, let's start to assemble a picture of what radio propagation might look like on Mars. First of all, I would suspect that ground wave propagation should be enhanced, due to the thinner atmosphere of Mars. Thus, a large vertical antenna should be able to communicate for a long ways a way. Okay, so ground wave propagation isn't anything new, or particularly exciting. How about the fun stuff? Ionospheric communication is most likely similar to what is seen on Earth, with a couple of notable differences. First of all, the distances would be similar to E level propagation in the United States. Even with a different radius, the distance of communication doesn't matter that much. The horizon would be much clearer on Mars, so you might get a bit of a boost from that. The amount of reflection will be less, due to the thinner atmosphere, but it should be managable.